Prototype: Two-part "Airport Express" train and building blocks for the Märklin my world Elevated Railroad. 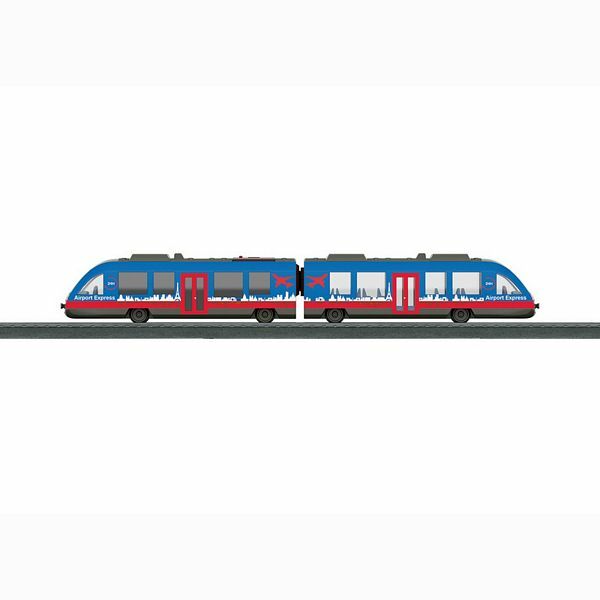 Model: The train has a battery-powered drive and magnetic couplers between the two train parts. The motor, battery, and all of the electronics are in the motorized train part and are not accessible to children. The train can be charged with the charging cable included with the set. The second train part provides all kinds of play possibilities with the removable roof and the interior. The train has 3 speed levels in both forward and reverse, 3 sound functions, and double headlights. The train can be controlled by means of the wireless infrared controller, the Märklin Power Control Stick. Train length 32.6 cm / 12-13/16". In addition, this starter set has building blocks for the Märklin my world Elevated Railroad. The train can run from Level 0 to Level 1 by building the elevated railroad. The elevated railroad pillars can be built to different heights to create a grade so that the track can go to the higher Level 1. The tracks go from Level 1 back down to Level 0 by means of a descending grade. Contents: The set has 12 sections of curved plastic track, 6 sections of straight plastic track (188 mm / 7-13/32"), 6 sections of straight plastic track (172 mm / 6-3/4"), 72 building blocks for elevated railroad pillars, and 14 adapter building blocks for mounting the track. The track sections and blocks are made of sturdy plastic just right for children. The track sections have a colored identifier for easy setup of the track layout. 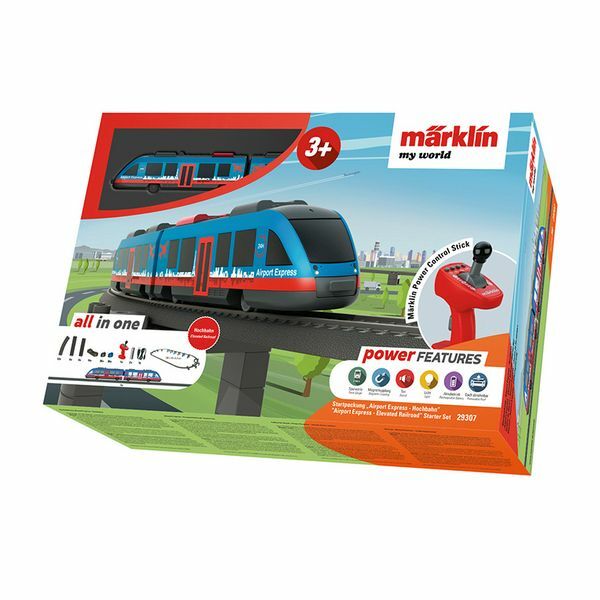 An easy-to-use wireless Märklin Power Control Stick is included. A charging cable and 2 AAA batteries are included with this set. The train can be operated with 2 different frequencies thus allowing another battery-powered train to be operated with this set at the same time. This set can be expanded with the 23302 elevated railroad plastic track extension set.